Great title! It’s the perfect little basket. Yes! That’s what I thought, too! I’ve never seen the seeds all by naked like that. Some sort of fun never doing it ? Hi Ed, I’m not sure I understand your question. I made this picture to catch the perfection of this lonely Queen Anne’s Lace at the end of its life cycle. As often happens, the image became an unexpected gift — showing an inner world that I hadn’t seen through the lens. It looks like the fine seeds that usually accumulate at the top have been stripped of and bundled inside the ‘basket’. It simply looks non-typical from most Queen Anne’s Lace seed pods I have seen. Ah, yes, I see. 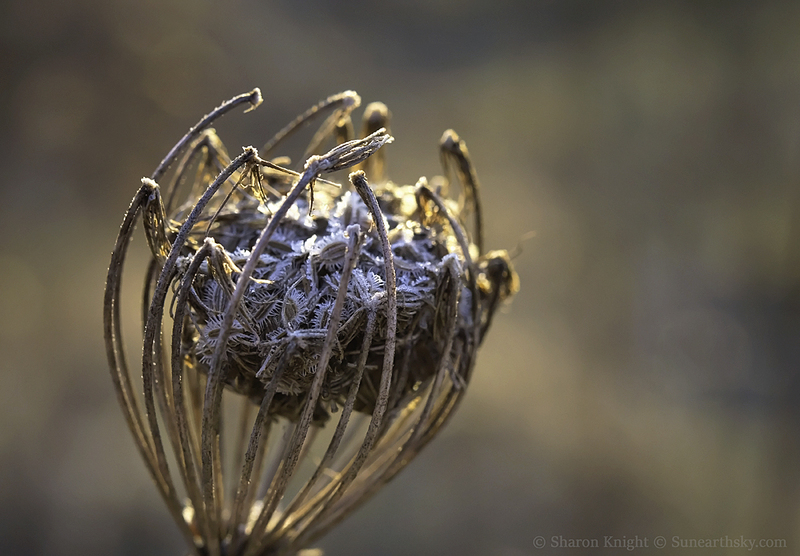 Most Queen Anne’s Lace winter blooms are a tangle of seeds and dried bracts. This one is pared down to its essence on the day before spring.